The White Plains accident attorneys at Worby Vecchio Edelman are experienced in all phases of personal injury litigation. We try to advise our clients on safety issues that are encountered in common daily activities. Some of those activities – driving a vehicle, safety around the home – are obvious. Others, such as safety in areas away from home, are less so. Children are out of school for about ten weeks in the summer, and because of that, parents are constantly trying to find healthy and constructive activities to keep them busy. Whether your kids are staying home, going to visit a friend or family member, or perhaps packing off to camp, there are simple and common sense rules to consider to help keep them safe. 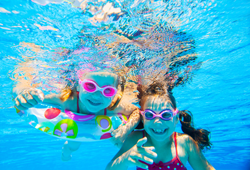 If you are all going to visit a family member that has a backyard pool, make sure that access to that pool is controlled, so that your children won’t be tempted to go swimming when it might not be safe to do so. An unsafe condition might not only be when no one is there to supervise – it could also be during a summer electrical storm. All of the precautions that you take at home won’t matter if the house that you are visiting is not child-safe. That means things like having guards over electrical outlets when there are younger children around, and taking precautions so that toddlers don’t suffer burns in the kitchen. If you send your children to sleepaway camp, become familiar with the camp’s safety rules. What does the camp do to prevent children running off by themselves; what about supervision during free time, when there are no structured activities scheduled? Of course, the most obvious supervision issue is during swim time, or if there is a lake at the camp, during any waterfront activity, such as boating, or even fishing. Take a proactive approach, and obtain knowledge as to what activities the camp offers, and what type of experience the staff has in teaching, conducting, and supervising those activities. Finally, don’t assume that the camp does its own background checks on its staff. Consider that camp staff will be with your child all day, every day that your child is there; ask management about background checks, and about anything that might make you uncomfortable. We all know that risk can never be completely eliminated, but by educating yourself at the outset you can at least be aware of the risks involved, and make an informed decision as to whether to allow your child to attend that camp, and participate in its activities. Become familiar with the camp’s medical staff. It’s also a good idea to be aware of the location of the nearest medical facility, or hospital, in case of emergency. You can take an extra step, and determine in advance whether the local hospital is an “in network” or “out-of-network” facility on your medical insurance. Summer activities around the house can also be made safe. Be aware of where, and with whom, your children might be playing. Without the burdens of homework and having to get up in the morning to go to school, you might allow your children to stay out later. Just make sure you know what they’re doing, and that common sense safety rules are followed. Given the field in which we practice, the White Plains accident attorneys at Worby Vecchio Edelman have seen many different types of cases involving summer injuries. Contact us if you believe you or a loved one has been injured due to someone else’s negligence. We’ll listen to what happened, answer your questions, and let you know our opinion as to whether you have a case. The consultation is always free, and we work on contingency, so you only pay us if we recover money on your case.